I’ve been wanting to post this post for a while, but it seems that every time I wanted to take pictures, the weather didn’t want to cooperate with a sunny day. Sigh, such is life in the fall and winter. 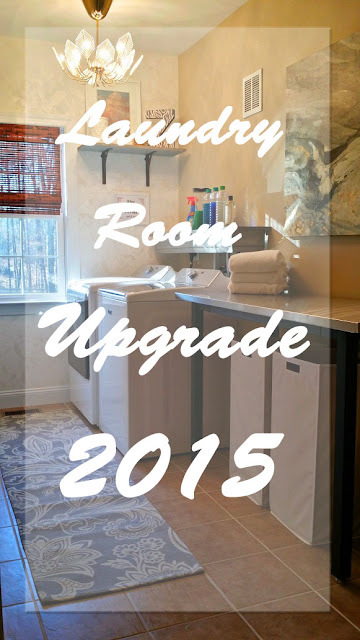 Anyway, I’m VERY excited to show you my new, updated laundry room! 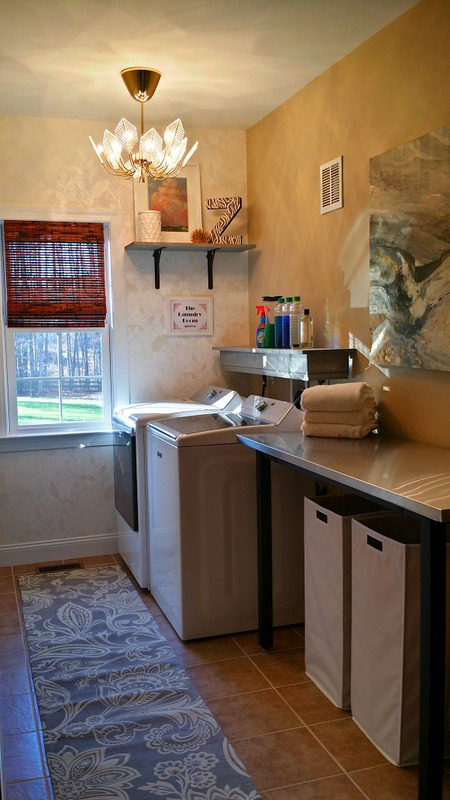 I think laundry rooms should be glamorous and fun; a place where you WANT to go. 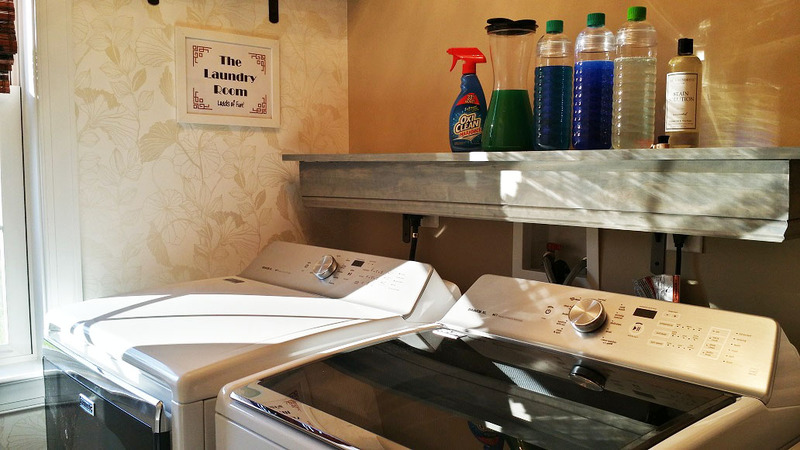 How many of you schlep down to a dark corner in your basement to do laundry? Not very inspiring is it? Well, I didn't exactly have to do laundry in a dark basement, but my laundry room certainly wasn't inspiring. Blah, right? Uninspiring and kinda messy. So I began my transformation with some wallpaper ideas. You can see the samples I was trying out taped to the wall in the above picture. 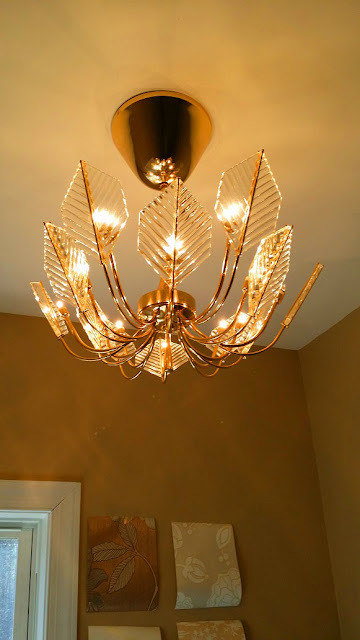 Next came this FABULOUS Italian mid-century chandelier that took us forever to figure out how to wire and install. This thing truly is gorgeous. I love it and want to marry it. But the transformation stopped there for several, several months until my 10-year-old washing machine started acting up. Really, it was on it's last legs. Besides not being able to select a few cycles on the control pad and only being able to use hot water on one cycle, it used to randomly beep out this morse-code conversation for minutes at a time. We used to joke that it was talking to the aliens. So, we had to go purchase a new washing machine, which made sense to include a new clothes dryer, since our old one was 10-years-old as well. 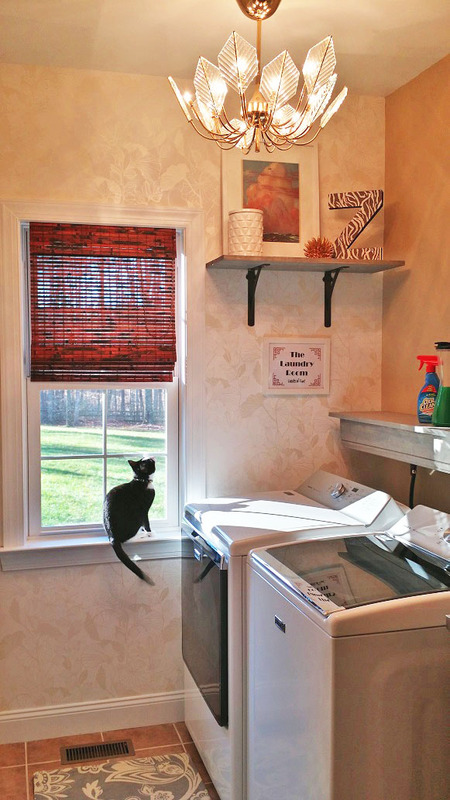 By this point, I had picked out the wall paper sample I wanted and had ordered it (hint, it was the second sample down from the top on the left), but was stalling on putting it up as I knew that meant moving the washer and dryer. Besides, I had never installed wall paper and I was nervous, so that made procrastinating easier. I'm not sure if you can see it in the picture with Leo sitting in the window, but the wall paper is a sort of iridescent and white ginko leaf pattern. I wanted something that would pick up the brass/gold from the chandelier and not be too busy or dated. However, there were some major changes that had happened once the wall paper, washer, and dryer were installed. I'm not sure if you can see it, but our new dryer sticks out about 6 more inches than our old one did, so that forced me to change my ideas for the shelving. 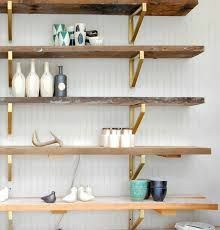 I also wanted and LUSTED over installing these brass shelf brackets from West Elm, but they were expensive and I would have needed like 9 of them to do what I originally wanted to do. 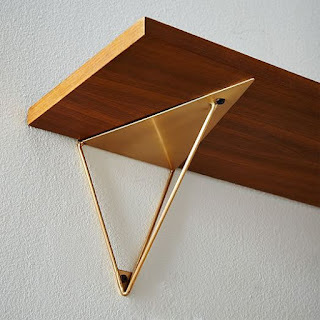 So then I thought, how about an Ikea hack like this? 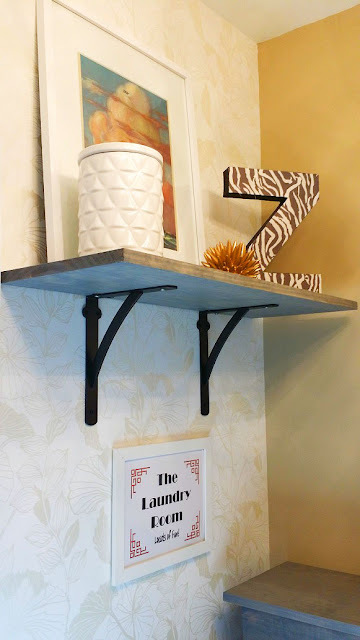 But, I wasn't digging it, and by then we were talking about selling the house, so I went with some very simple bronze brackets I got from Home Depot. BUT, remember this old chandelier from before the kitchen remodel? This will replace the mid-century chandelier when we move...I am taking that baby with me! 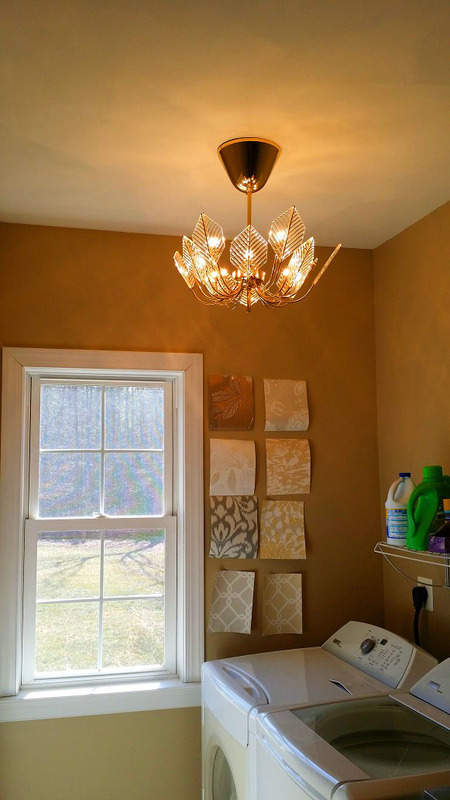 So, in hindsight, this old chandelier will match the black shelf brackets better. 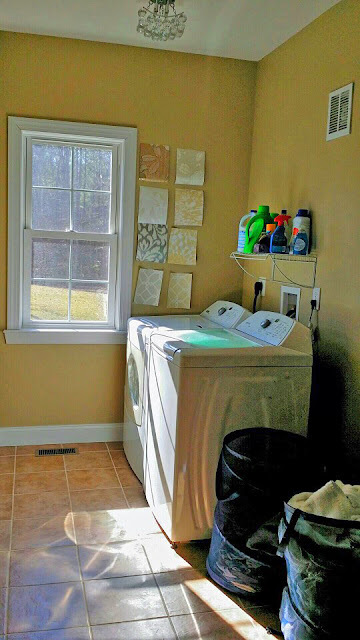 I built and stained the shelf above the washer and dryer, as I wanted something with a skirt that would kind of hide the electrical outlets. I love my nail gun! The shelf stain color is supposed to be "weathered grey" but it came out with more of a blueish tint, which actually tied into that piece of art I got from World Market. 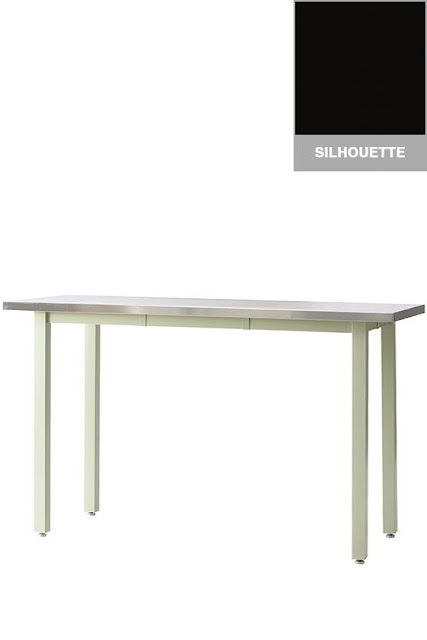 Let's talk about that table! The stainless steel table is from Home Decorators Collection, which is a subsidiary of Home Depot. It's a Martha Sterwart piece and is actually part of her garage organization collection, but it's the perfect height to stand in front of an fold laundry. It comes in three colors! 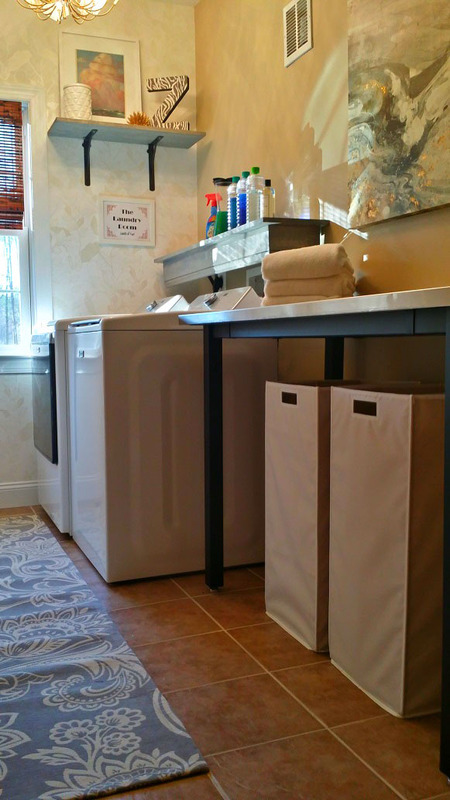 I also want to talk about those laundry hampers. 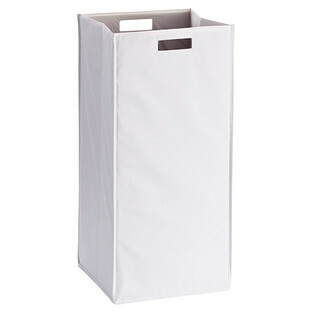 They are from The Container Store and they are SUPER strong and durable! 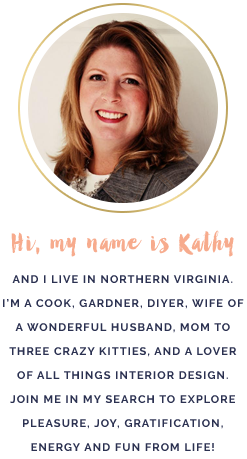 We have a third one up in our closet for dirty laundry. When I need to bring it downstairs, I literally grab it by the handle and drag it down the stairs without picking it up. I've been doing that for almost 2 years and the handle hasn't broken or shown any wear. Worth every penny. 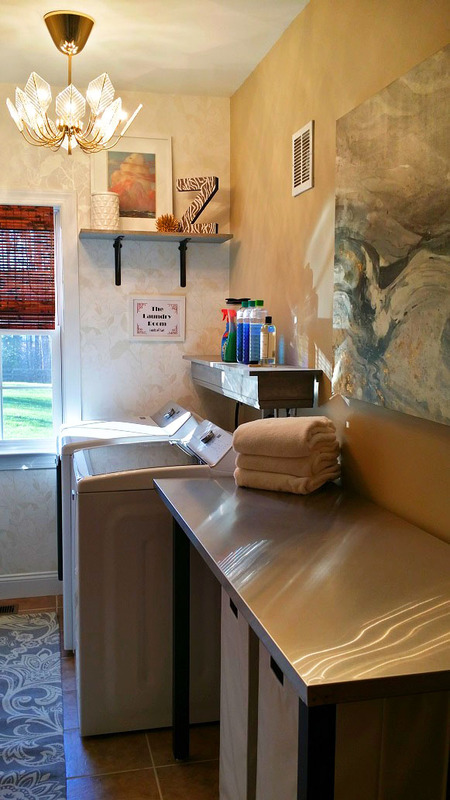 Since we've updated our laundry room, I've been kind of a laundry nerd. Yes, I have bought into buying and using The Laundress products, even though they cost an arm and a leg. Don't hate, I love the smell! 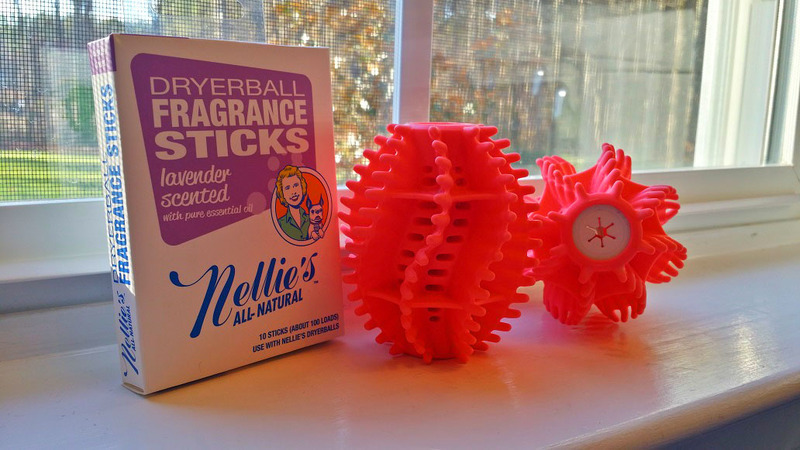 I've even taken to using these laundry balls in place of dryer sheets. They make the the clothes, and especially the sheets smell SOOOO divine. Mostly, I just love yelling, "HONEY, HAVE YOU SEEN MY BALLS?! WHERE ARE MY BALLS?" Lastly, I want to talk about my Bravos XL 835 washer and dryer set. So far, I've been very happy with them, but they do make some odd noises that I haven't determined if they are "normal-odd" or "not-normal-odd". My thought is, BREAK NOW IF YOU'RE GOING TO BREAK since they are under warranty. 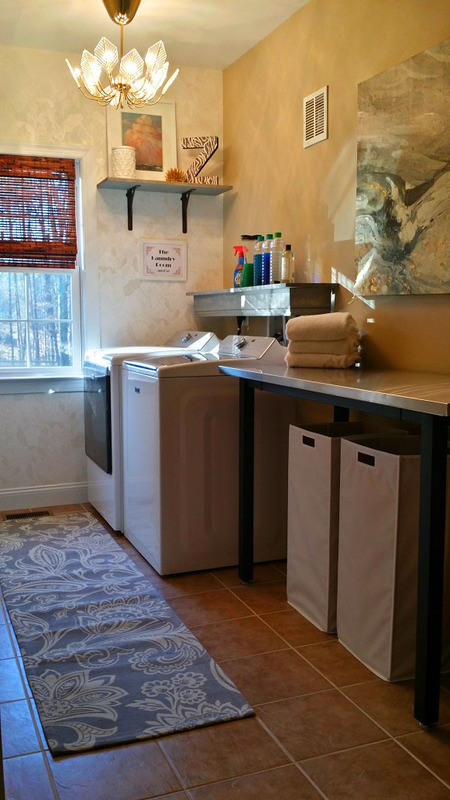 So, that concludes my glamorous laundry room journey. 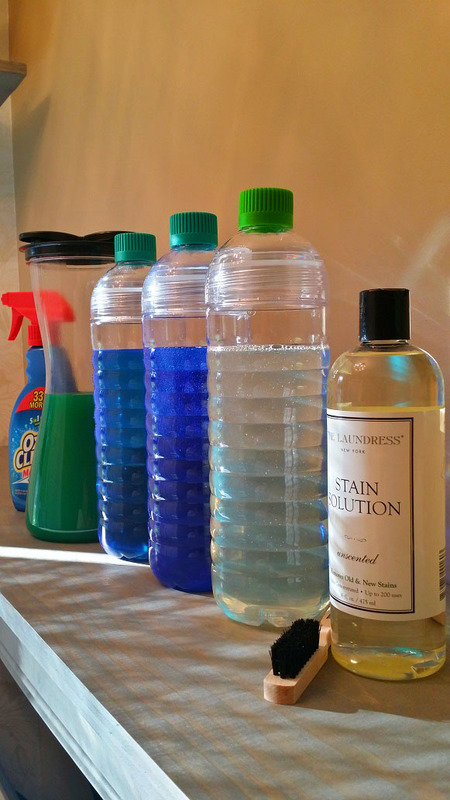 I love doing laundry now, and even tell my husband to not touch it! I'm having so much fun!